IT'S BACK! The Original 3 Piece Liquid Kit with that BOOK that has THREE EASY STEPS to fight cavities and gum disease! 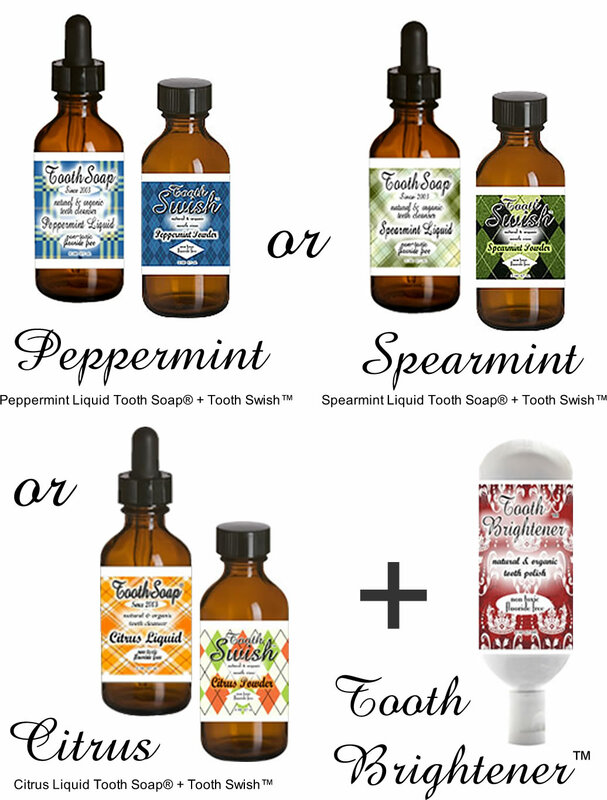 This very special Tooth Soap® offer includes your choice of these popular flavors: Peppermint, Spearmint or Citrus Liquid Tooth Soap®, a coordinated Tooth Swish™, a Plain Jane Tooth Brightener™ and you also get a FREE COPY of The Perfect Prescription For Your Teeth for ONE LOW PRICE SAVING YOU MONEY! This is a COMPLETE KIT to get you started on your way to a non-toxic and effective, natural approach to taking care of your teeth and gums for life. Liquid Tooth Soap®‘s non-toxic formula deep cleans your teeth and gums, just like a tooth cleanser should! Tooth Swish™ neutralizes acids, freshens breath and can be used between brushings! Tooth Brightener™ brightens your teeth and removes the most common every day food and drink stains! My personal dental health guide (The Perfect Prescription) reveals a NATURAL APPROACH to taking care of your teeth and gums and includes a STEP-BY-STEP at home protocol with recommendations for food and supplements that boost dental and whole body health. Regularly $109.80, NOW only $64.85! To order this COMPLETE KIT, just pick your favorite flavor. "The Perfect Prescription For Your Teeth". This pocket-sized, 71-pg. booklet packs a powerful health wallop and reveals a natural approach to taking care of your teeth and gums that may well keep you out of your dentist's office for the rest of your life. Your teeth will be so clean and healthy you can fully expect to take them to the grave with you without ever having to go to a dentist again. Do You Eat Food? Of course, you do. Everybody who eats knows how important it is take care of their teeth. Well, one mother has discovered a method involving simple, natural steps that anyone can take on a daily basis to avoid cavities while building healthy teeth and gums. This natural approach beats the tar out of the dentist's chair and expensive, painful, traditional dental procedures that may possibly cause as many problems as they solve. Look what you will discover in "The Perfect Prescription For Your Teeth", a natural dental hygiene resource that belongs in the library of health seekers everywhere. Bothered by gum problems, cavities, and osteoporosis? How dental visits may cause cavities. Getting rid of bad breath for good and more! In fact, there's A LOT MORE, but you get the idea. You must get a copy now if you want to take the natural route to better teeth and gums. "The Perfect Prescription For Your Teeth" is in the hands of thousands of people who are now saving $$$$ on dental bills! 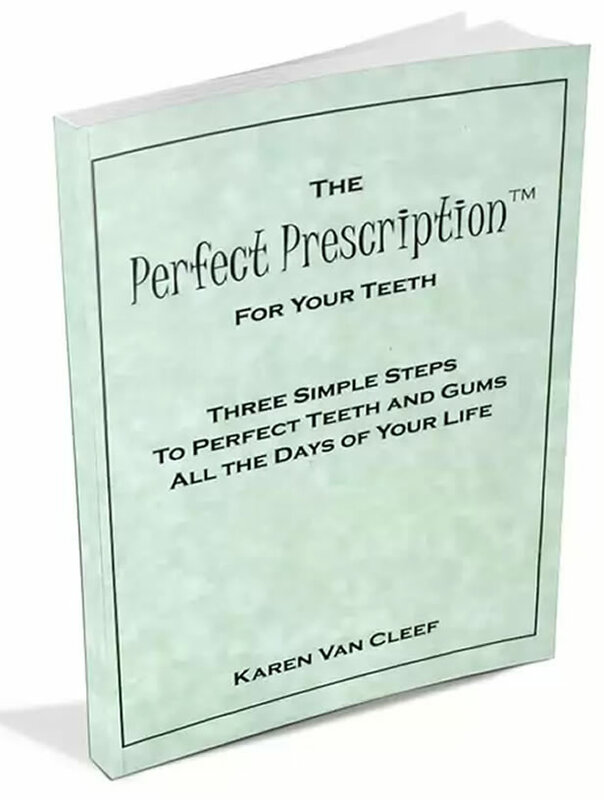 "The Perfect Prescription For Your Teeth" is a small booklet that can easily be put into a purse or briefcase. This book was purposely printed in a smaller format so that people could keep it with them and share the valuable info with others easily. Unfortunately, there are limited quantities of the book available. Even though the ISBN list price of "The Perfect Prescription For Your Teeth" is $29.95 (U.S.), copies have been selling like hot cakes because people compare that cost to a typical visit to the dentist and quickly realize they've just run into a real bargain. PLEASE NOTE: I have been selling this little gem of a book since 2003 at the $29.95 price, but now I am practically giving it away because I want you to have this tooth and gum saving information! But the REAL reason why the book is ridiculously limited is because once this batch is gone, I'm no longer going to publish it. It will become vintage someday, so get your copy now!